It’s the most wonderful time of the year! Unless you dread the inevitable holiday stress, that is. You’ve been working hard to restore your healthy Sense of Self all year long, and you’ve come a long way with your self-care practice. But when the pressures of the season catch up to you—gift buying, trip planning, hosting guests, and extended family time—it’s easy to regress into old habits. Ready to establish a self-care practice to relieve holiday stress this year? Opportunities for gaining approval abound this time of the year, which is especially challenging when you live with a Substitute Sense of Self. When you let your ego-references drive your behavior, the question of how to deal with holiday stress becomes even more complex. 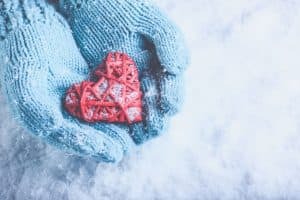 Make things easier on yourself this year with a few holiday stress relief tips that will help you overcome your anxiety and defend the progress you’ve made on your Self. Don’t go overboard with the gifts. Consumer culture creates an enormous amount of pressure to showcase your love via material objects. Non-material gifts, like vacations, spa treatments, and other customized “experiences,” can be no less loaded with exhibitionist intent. It is the rare individual who is immune to the pressure to spend on personalized, often costly presents. When indirect motivations drive you, you may decide on a gift not with the other person’s enjoyment in mind, but with the hidden goal of gaining his or her approval. Whether you checked off your list well in advance or are putting the shopping off until the eleventh hour, take some time to do a motivation check. Are you buying these gifts because you want others to see you as generous? Attentive? Imaginative? If gift-buying is a significant source of stress for you every year, try budgeting for the holidays to impose some limits on yourself. Or consider getting the same thing for everyone: chocolates, gift cards, cozy winter socks. Some people won’t approve—but that’s on them, not you. Carve out time for yourself. Don’t neglect your mental or physical health over the holidays. It’s often the first thing to get pushed aside, and it will have a major effect on your ability to handle challenges. Continue to explore ways to practice self-care in between the parties, recitals, and shopping trips. Get outside, write in your journal, and use diaphragmatic breathing to stimulate your parasympathetic nervous system. Decide ahead of time what your limits are regarding the time and energy you give to others. Keep family time in perspective. Old family tensions tend to resurface around the holidays. Whether your instinct is to mediate, lash out, or withdraw, your gut reaction to these dynamics is a wide open window into your early childhood survival strategy. Whether you’re traveling to see family or they’re coming to you, seize the opportunity to practice mindful and compassionate communication with your loved ones. If this seems impossible, take note of the feelings you have about how your family communicates. Notice how you initially want to react and respond to what others say. Then ask yourself: How can I communicate in an effective, yet loving way? It’s unlikely that you or anyone else will undergo a personal transformation at the dinner table. Compassionate communication is a skill learned through observation and repetition. However, the holiday season as the perfect time to practice your new style of communication. These words that prompt both inspiration and dread. As you plunge into the mad holiday rush, let yourself feel gratitude and pride for the work you’ve done. Restoring your Sense of Self is a gradual process . . . And casting out old habits doesn’t happen overnight. Enjoy your self-care time and your time with your friends and family. Commit to a healthy Sense of Self for the new year with the Sense-of-Self Help Online Course, a nine-week program that gives you the support you need on your journey to becoming a fully realized person. Kick off the new year & your self-care practice with us!